There is a brief respite from The Summer of Meh this weekend, not due to original content, although there is some of that, but because in the middle of the multitude of pointless sequels, we are finally given one to a movie that at least makes some sense. One of the big changes to Pixar after its official acquisition by Disney was a greater commitment to sequels. These have ranged from the transcendent and world expanding (Toy Story 2) to dire cashgrabs (Cars 2) with a others squarely in the middle. Finding Dory, this Friday's new release from the animated hit factory, might just finally get back to that first category. A sequel to 2003's Finding Nemo, which 13 years later (man, those fish would be long gone) is still the third highest grossing Pixar film, it reconnects with the breakout character from that film, the Ellen DeGeneres-voiced anmesiac blue tang fish, as she gets a flash of memory and attempts to journey across the ocean to find her family again. In addition to DeGeneres, we also have the return of Albert Brooks as Marlin, guiding her along the way, and the sequel has added the voices of Katlin Olson, Ed O'Neill, Ty Burrell, Diane Keaton, Idris Elba, Bill Hader and the fish tank crew of the first film. 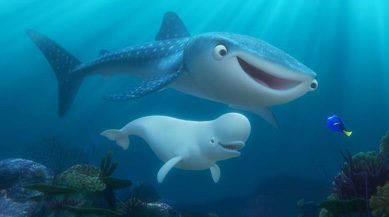 One of the most beautifully animated films of Pixar's stable, the sequel promises advances on the gorgeous scenery of the ocean and its inhabitants, but also makes a move away from the sea to an aquarium environment. More than that, though, the original had one of the best overall stories of Pixar's history, which is a large part of its staying power. A strong connection to family and loyalty was worked throughout the film, and that appears to be present once again. Finding Dory arrives at kind of a crucial moment, half a year after Pixar had what you might call its first ever “bomb,” The Good Dinosaur, which opened to just $39 million. While the continued move towards franchisation is perhaps a bit cynical on their part, it's a studio with something to prove. Reviews of the film are spectacular and Toy Story-ish, and Finding Dory has received a huge media blitz thanks to its eminently marketable stars. When Pixar is on, it's *on*, and Finding Dory looks to be able to reach for the very heights of the studio's performance. Their own $110 million opening record for Toy Story 3 looks ready to fall, with about $120 million earned this weekend.